Peel the pear. Then, cut into a roughly 1/2-inch dice. Transfer to a small bowl and then add the honey, flour and salt. Stir well until combined. Unroll the pie crust and cut into four quarters. Divide the pear mixture evenly among the pie crust pieces, piling it into the center. Moisten the edges of the pie crust pieces with your fingertip. Fold the pie crust over the pear, forming a pocket. Press the edges to seal. Then, use a fork to press gently along the edges to seal more and create a decorative edge. Brush the tops of the turnovers with the egg white and then sprinkle with sugar. Bake for 25-30 minutes, until lightly browned. Serve immediately, or store in an airtight container until ready to eat. Honey. Pears. Flaky crust. How can you go wrong? Despite my best efforts to cut back on our grocery runs, I keep finding myself heading back to the neighborhood store to pick up forgotten ingredients. Today, in frustration, I ended up buying five different cans of beans, in hopes that I would avoid another trip this week. Fingers crossed for that one. Today’s trip was also to pick up the honey and pie crust I forgot to buy yesterday. Although I typically keep a good supply of both on hand, I found my honey all crystallized this morning and the pie crust gone. Whoops. But the trip was totally worth it since it resulted in a batch of Easy Honeyed Pear Turnovers for us to enjoy. As far as desserts go, this is one that the whole family enjoys. 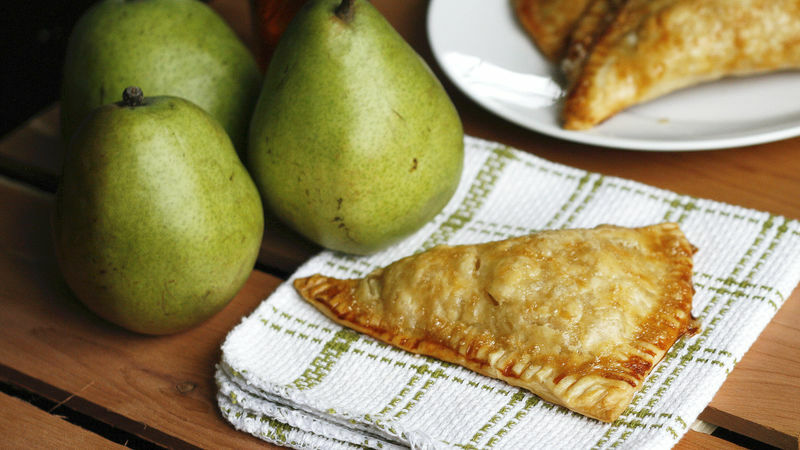 My husband and daughter love the flaky, savory crust, while my son and I adore the sweet honey and pear filling. It’s a win-win for all of us. When I make these, I prefer to use D’Anjou pears, which keep their shape even after cooking. So, when you bite in, you get a mouthful of soft, honey-coated pears. It’s divine. Serve these babies as dessert with coffee for the adults. They go really well together. Are you a turnovers fan?